Gift will be used to support a traveling educational exhibit about Perkins' life, legacy. The Frances Perkins Center in Damariscotta was recently awarded a $30,000 grant from Newman’s Own Foundation, the independent foundation created by the late actor and philanthropist, Paul Newman. The award was made by the foundation as part of its commitment to the empowerment of individuals, according to a news release from the center. 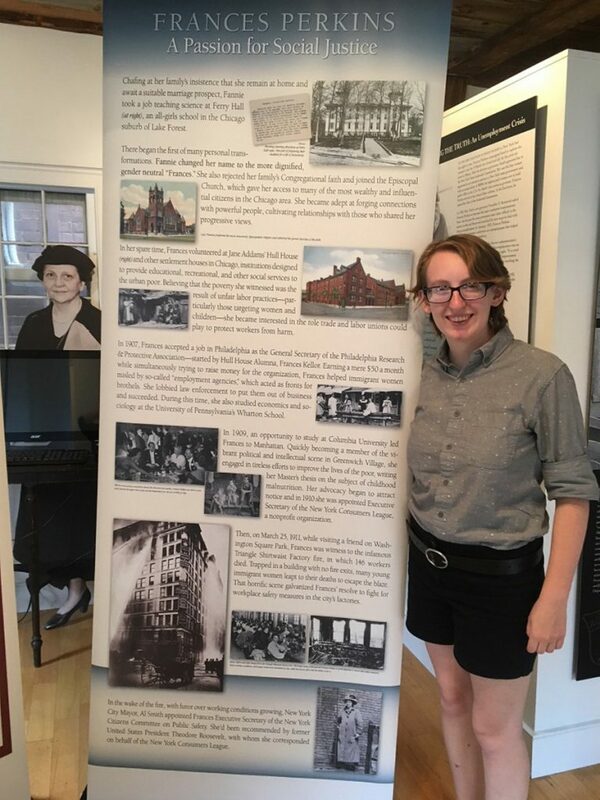 2018 Mount Holyoke College/Frances Perkins Center intern Ally Kelley with a travel exhibit panels. Photo courtesy of the Frances Perkins Center. The grant will be used to support a traveling educational exhibit about Frances Perkins’ life and legacy. The foundation joins additional project funders; Katharine J. Watson, the Maine Humanities Council, and the Maine Community Foundation’s Lincoln County Fund. The exhibit includes five standing panels interpreting Perkins’ life and legacy, as well as a video featuring work from prominent scholars. The curriculum targets middle and high school students. The Maine Community Foundation’s Lincoln County Fund grant supports exhibition and curriculum specifically for Lincoln County schools. The Newman’s Own Foundation grant supports the creation of a second set of panels and expands the center’s outreach to schools and libraries in three key areas, (Massachusetts, New York and Washington, D.C) in addition to Maine, where Perkins worked and lived throughout her career, thus helping us achieve another step in the center’s long-term goal of reaching a national audience, according to the release. Perkins, who was the first woman to serve in a U.S. Cabinet, had deep roots in Maine. During her time as Franklin D. Roosevelt’s secretary of Labor, she regularly returned to her family estate in Newcastle, the place she called her one true home. Founded in 2008, the Frances Perkins Center at 170 Main St. preserves and continues Perkins’ legacy. The center works with historians, biographers, and other scholars to educate the public about Perkins’ life and achievements. It also brings together leaders of today and tomorrow to examine modern public policy questions through the lens of Perkin’s own experiences and values.